New research into stealth camouflage fabric looks for inspiration from the inhabitants of the deep blue. We are all familiar with military camouflage of today, as seen in many games like Call of Duty. However, whilst many may indeed be made from high tech fabrics that promote durability and the all important aura of secrecy, very few manage to effectively silence the array of infrared light that illuminates a person when seen through a night vision camera. Now, with new research from the University of California Irvine, scientists have taken one step closer to creating the ultimate stealth fabric that would completely mask a soldiers presence on the battlefield with an innovative new coating. The film, 100,000 times thinner than a human hair, takes after the camouflage ability used by the squid, whereby they change both the color and texture of their skin in order to hide from predators in the ocean. Its fundamental purpose is to be attached to any surface and change the way in which it reflects infrared light, using either a chemical command signal or ambient humidity to turn the material on and off. 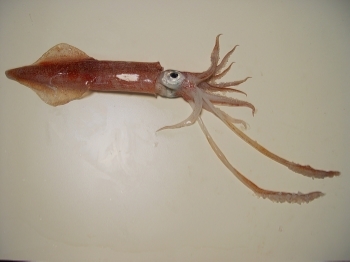 A protein called reflectin is the building block of the new coating, found in the skin of the long fin squid, Doryteuthis pealeii. In initial testing, scientists have managed to make an orange surface blend into a green foliage background, an impressive feat of abolishing clashing colors. The possibilities for this new breakthrough are near limitless. The potential to have fabrics that activate in the humidity of night or through micro-beads of chemicals laced into the fiber itself are surely the dreams of Sam Fisher. And with the team noting the film's ability to tweak the color emitted to not only blend in with the background but change its features all together, we could be seeing shape shifting fabrics in the none-too-distant future. How long until the military release it to the general public? Everything, or almost everything, we take for granted these days started out in the military and they released to the public after x number of years. I'd love to have the Predator's cloak......since I was just in a GTA V thread a few minuets ago, let's put the cloak in GTA V.
Yeah, I'll never do that again. Hey? Is this going to affect the way something looks due to reflected heat, or due to the heat it's producing itself? Because you can deal with your thermal signature by being well insulated...only there are obvious overheating issues with that. Changing the way you look on active infra-red might be new, but couldn't you simply wear something camouflaged in the IR spectrum to your surroundings? You'd not have one outfit for everywhere, though. That's nice and all... but wouldn't it be much simpler to just train squids how to use arms and why our side is much better than the enemy's? I don't really have anything to say about this, I just felt obligated to post this picture. This is pretty cool though, science and all that. This is basically OctoCamo from MGS4, but with squid and currently only for IR light.